Lotería Jarocha assembles a series of linoleum-block prints created by Mexican-Canadian artist Alec Dempster after his return to his native Mexico in the mid-1990s. Discovering a lively genre of folk music from the Veracruz region, Dempster subsequently devoted himself to documenting his heritage with printmaking. The result is Lotería Jarocha, a collection of expressive images which catalogue Dempster’s encounter with the vibrant son jarocho culture of his birthplace. In the mid-1990s, artist and musician Alec Dempster returned to Mexico, the place of his birth, and discovered son jarocho. A genre of folk music from the Veracruz region of Mexico, son jarocho originated in the 17th century with the confluence of Indigenous, African and European peoples. In Veracruz today, musicians can still be heard singing these traditionalsones, passed down orally through the generations as themes or tropes, rather than songs with set lyrics. As Dempster immersed himself in the tradition, speaking and playing with rural musicians, his exploration of the culture resulted in a series of linoleum prints, each depicting a traditional son. Dempster’s imagery, playful and enigmatic, provides a window into a culture virtually unknown outside Mexico. In this stunning collection, Dempster lends his own voice to the prints for the first time, illustrating their genesis and origin in clear, unassuming prose. With Dempster as guide, Lotería Jarocha draws its reader into an infectious culture of music, laughter and dance. The rain in Santiago Tuxtla has two flavours: the torrid din of a summer downpour and the penetrating cold of a slow winter drizzle, called aguanieve. In December, damp weather often muffles the sound of nocturnal processions along streets and down alleyways when musicians gather, moving in multiple directions, each with a chorus of followers. Time and place are blurred by the mist and steady rain saturated with the collective incantation of a familiar refrain: ‘Oranges and limes, limes and lemons. The Virgin is more beautiful than all the flowers.’ The tranquility, however, is sometimes interrupted by northerly winds which invade the night with violent gusts, shattering windowpanes and rattling tin roofs. Many of the verses associated with this son mention tears, rain and the sea. Longing and departure are also common themes. Perhaps El Aguanieve originated along the coast as a lament for sailors out at sea, with other lyrics attaching themselves to it on its journey inland to places like Santiago Tuxtla where this son has been played for many generations. Most people sing El Balajú without considering what the title might mean or what the son may be about. This is not surprising because balajú is an archaic word that has disappeared from the dictionary and common usage. Some clues may be found in the verse which is usually sung as an introduction. Balajú set off to sea. – Come and navigate with me. Who’ll be first to cross the ocean? Shall it be you? Shall it be me? The maritime theme makes sense in relation to a definition published in 1859 referring to balajú as a schooner found in the Caribbean as well a type of boat used on the Bay of Biscay. The origin of certain verses and songs has been traced to very old songbooks. A songbook from Santiago Tuxtla includes a couple of pages of verses for El Balajú. One verse mentions The Port of Veracruz, Havana and El Muelle Inglés. The latter may refer to a historic port in Panama. In 1958 Richie Valens rebranded the most emblematic of sones jarochos, in a rock and roll setting. He took his cue from early versions of La Bamba sung by musicians from Veracruz who had found a place in Mexico City’s burgeoning film industry and night club scene. Verses associated with La Bamba indicate that it may have originated in the Port of Veracruz during the seventeenth century when the population lived in fear of attacks by ‘Lorencillo’, a dreaded Dutch pirate. I first heard a more traditional interpretation of La Bamba in 1995 on a tape of field recordings made in Los Tuxtlas. A year later I heard a similar version after stumbling off a bus in Santiago Tuxtla. I had walked just a few blocks under the searing July sun when I came across a group of old musicians huddled together playing La Bamba under the protective shade of a storefront awning. They were from different communities taking part in the annual celebrations of the town’s patron saint. After attending a few fandangos I realized that La Bamba is still very much at the heart of the traditional son jarocho repertoire. Six short notes are enough to announce the arrival of El Zaptateado with a cavalcade of nails quickly following suit across rows of expectant strings. Two brazen chords are unleashed and begin to sway back and forth like a pendulum, creating the thick sound emanating from the fandango. Meanwhile, the guitarra de son weaves an endless string of melodic variations within the harmonic tug of war. Dancing couples take turns facing each other on the tarima to engage in the rhythmic dialogue. Singers jump into the fray with a piercing cry of ‘Ayyyyy!’ as a signal for the dancers to quieten their steps. In spite of the sudden lull each verse must be forcefully sung over the rumble of hard soled shoes, boots, and the cumulative drone of strings and staccato melodies. Throughout the son disparate voices ring out from all around the tarima, drawing from an old well of memorized poetry. The dancers wait impatiently on the sidelines for the end of each verse. Only then is there an opportunity for a change of partners, indicated by a gentle tap on the back. ‘Se necesita un poco de gracia: you need some wit and grace to dance the most famous Jarocho song La Bamba and to understand it. Likewise the Lotería Jarocho graphics by Mexican/Canadian artist Alec Dempster are a witty combination of graceful and meaningful love declarations towards the Veracruzanian music and Mexican graphic art. At the same time illustrating the hidden meaning of the songs lyrics, the graphics refer to the very popular Mexican game of lotería, where instead of numbers as in the comparable Bingo game, words and names are to be collected on the board until a winner filled his board first. while riding on his horse. In the late 1990s, the young Mexican-Canadian artist, Alec Dempster, embraced son jarocho, a musical tradition with indigenous, European (primarily Spanish) and African components that emerged during the Spanish colonization of Mexico centuries earlier. Dempster was also attracted to the Mexican board game known as lotería, a game of chance of Italian origin, brought to Mexico from Spain in the eighteenth century. Both music and game provided the artist with ways to connect with the culture of his birthplace. This book includes a suite of some sixty linocut prints by Dempster that can be appreciated as works of art, as illustrations for a board game and as emblematic expressions of lyrics for son jarocho songs, called sones, that can trace their origins some three hundred years into the Mexican past. A visual artist and musician who was born in Mexico City in 1971, Dempster grew up in Toronto, where he received his formal training in art at York University. These prints were created when he resettled in Mexico a dozen years ago and began researching and learning son jarocho music. The learning process involved collecting oral histories, making field recordings with elderly musicians and playing with son jarocho musicians in a variety of settings all over the southern Mexican province of Veracruz. This research resulted in Dempster’s self-published book, Faces of Son Jarocho (Rostros del son jarocho), a collection of interviews and linocut portraits of elderly musicians, singers and dancers from Veracruz. More than portraits, his prints pay homage to some of those who have devoted themselves to the local traditional music that has been a central part of their lives since childhood. Prior to this research project, Dempster delved deeply into the son jarocho tradition. In 1999, he began recording the musical diversity of the region of south-east Mexico, and also began to illustrate the repertoire of traditional sones, before considering the format of the lotería game. Although Dempster’s main objective was to illustrate the son jarocho repertoire, and not to create lotería images, as he continued to work and began exhibiting the finished prints in art galleries, the original intention evolved into a lotería. When arranged on the walls of galleries in a grid the prints resembled a board game format more commonly associated with a bingo card. This similarity triggered an impulse to expand the series from its original thirty images to the sixty that are presented on the following pages. Lotería is a game of chance played throughout Mexico. It is similar to bingo except that it involves a series of fifty-four pictures instead of numbers. As players watch their picture-filled game boards the caller pulls illustrated cards from a deck one at a time, and either recites a corresponding saying relating to the picture or simply announces the name printed on the card. Players with the matching pictures on their game boards place a marker on them. There are different ways to win, such as being the first player to place markers on all the images, filling the four corners or making a horizontal line or a cross. To appreciate the full dimension of these prints, one needs to be aware of their relationship to the musical form of son jarocho. As traditional folk music, the songs grew from the fertile and diverse region and culture of Veracruz where a mix of cultures – European, indigenous and African – produced a dynamic form of dance music that blended these three distinct influences. The Spanish introduced stringed instruments, such as violin, harp and the baroque guitar to the indigenous population. Over the next three centuries, the musical mix developed with indigenous Mexicans, mestizos and criollos developing their own regional variations of the musical instruments based on the European models. Most commonly associated with son jarocho is the small guitar-like instrument known as the jarana which is strummed; the guitar de son or requite jarocho, which is plucked with a long pick traditionally made from cow-horn; the harp; an octagonal frame drum, known as the pander jarocho; and the quijada, an instrument made from the jawbone of a donkey or horse. Just as regional instrumentation developed, so too did distinct variations of musical form and dance traditions. Son huasteco from east-central Mexico, and the west coast’s son jaliciense(also known as mariachi) were two such variations; both are as unique and individual as son jarocho’s identifiable percussive rhythms, syncopation, vocal style, improvisational base and harmonic and rhythmic frameworks. The term ‘jarocho’ as applied to the people and music of the region was originally used with disdain to characterize people of mixed indigenous and African origin; it eventually, however, became an assertion of pride. In colonial times, the Church sought to suppress certain sones jarochos because of their so-called ‘devilish qualities’ and some sones were banned, especially those which poked fun at religion, and because of the way in which they were danced. Double meanings, often of a sexual nature, are abundant in the verses. The son jarocho repertoire consists of approximately one hundred individual songs, many of which Dempster has interpreted in his prints. They cover a wide range of themes, but there is the built-in requirement and expectation that jarocho musicians (of which Dempster is also one) improvise their own melodies, rhythms and verses, to such a degree that no two jarocho performances are identical. Variation and improvisation are key elements of a son jarocho performance, enabling the musician to channel the energy and enthusiasm of the audience immediately and directly. 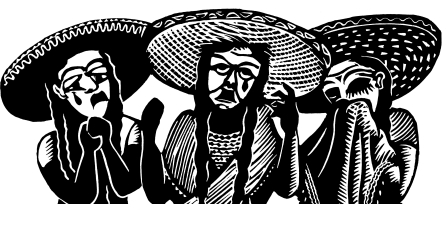 The fandango – a gathering of musicians and dancers who collectively interpret son jarocho – is at the core of this tradition in which musicians play, sing and dance the zapateado atop a wooden platform called a tarima, much like that shown in Dempster’s linocut of El Colás. This reverie is governed by a common understanding of procedure and etiquette, such as sones to start the fandango, sones to play at dawn, sones for women or couples and sones with specific choreography. At the heart of son jarocho and the fandango is its role in building and strengthening the community. There is a communal aspect to the musical form with its inclusion of professional and amateur musicians as well as the ability to bring together families, generations and different social classes. If you become interested in son jarocho, which Dempster also performs with his wife, Kali Niño, you join a community that is instant, present and has a legacy centuries old. It is a form whose animating principle is the need to share stories, laughter and, in the pithy, riddles and moral devices that are the lyrics to the songs, share some large or small life lesson. In these lotería pictures Dempster tells us that as long as son jarocho musicians learn and hold onto the roots of the music and its social dimensions exemplified in prints like these, the tradition will thrive wherever the music is played. 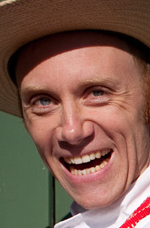 Alec Dempster was born in Mexico City in 1971 but moved to Toronto as a child. In 1995 he moved back to Mexico and settled in Xalapa, Veracruz, where his relief prints eventually became infused with the local tradition of son jarocho music. Alec’s conversations with rural musicians, presented along with thirty linoleum portraits, have been published recently as Faces and Voices of Son Jarocho. He has produced six CDs of son jarocho recorded in the field but is perhaps best known for his two lotería games – El Fandanguito, Lotería de Sones Jarochos, and the Lotería Huasteca – which include over a hundred prints. He has had solo exhibitions in the United States, Canada, Mexico, France and Spain. Alec now lives in Toronto. His own son jarocho group, Café Con Pan, has recorded two CDs, the most recent being Nuevos Caminos a Santiago. They are currently the recipients of a Popular Music grant from the Ontario Arts Council.